You might wonder, looking at this map, how it’s possible we expect this race to last into the spring. We all have to admit that Mignonnette is motoring. We are pretty certain she’s headed toward French Guiana. When we tagged her at the beginning of August off Cape Breton Island, our team found a French Guiana PIT in her shoulder muscle. PIT stands for “passive integrated transponder.” PITs are the same microchips that your vet might use to mark your dog or cat. Researchers implant them in leatherbacks’ shoulder muscles as a way of identifying individual animals. But despite her speed at this point, Mignonnette won’t haul up on a beach anytime soon. None of these leatherbacks is likely to nest earlier than March. Bulked up on Canadian jellies, they cover incredible distances in a relatively short timeframe before reaching waters off the nesting beaches, where they’ll hang out again to feed. 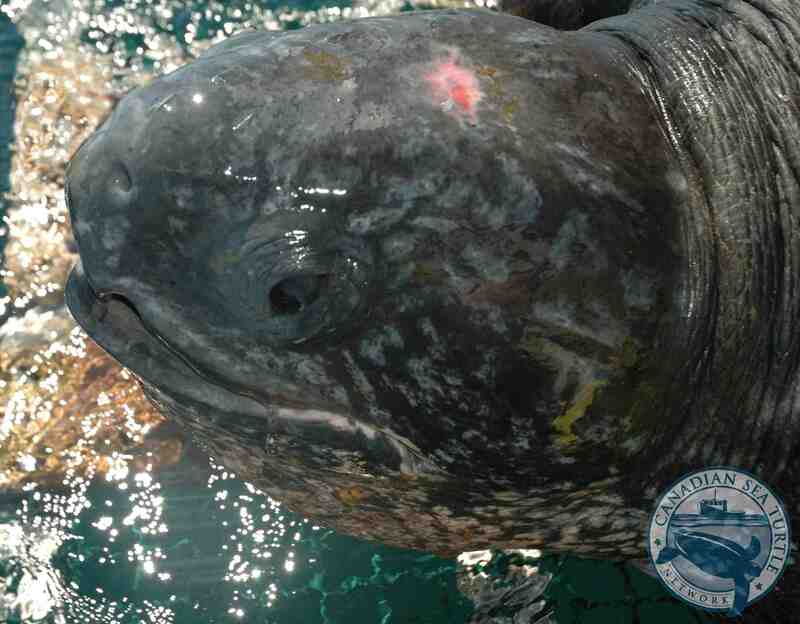 This is a photo of Mignonnette that Devan, our turtle technician, took when we satellite tagged her. Two maps today: one from this week (bottom), one from last (top). I have just been looking at them carefully, trying to spot the differences. Who has moved where? Most of the tracks have stretched out just a little more. Riley—no surprise to us at this point, perhaps—is zigzagging a bit. If you trace Koopas’ track with your finger, you’ll see it descending almost like stairs. Our turtles are swimming their way down the length of the United States. It is Thanksgiving Day there now. And although I’m happily perched on the edge of the Atlantic Ocean here in Halifax, today I miss my family in Illinois. I miss how this holiday in particular gathers that country together. I’m also thinking about our American sea turtle colleagues—the thoughtful, creative, intelligent, committed, inspiring, undeniably kooky people who are determined to keep these animals on the map. And I’m thankful for them. In the lead, at the moment, is Lily Rose. This turtle is special to me. It is named for Miss Lily Rose Rosploch, a little girl I know. This spring, a terrible thing happened to Lily the girl. On the day she turned three she was diagnosed with cancer. Stage four neuroblastoma. Neuroblastoma is an awful word. It makes me sad to type it. But Miss Lily is a fighter. And she’s giving this everything she’s got. In the face of this frightening disease she is funny and thoughtful. She is patient. She dances. She plays with her brand-new baby sister, Mya. She wears the love around her like a shield. And far away in the Atlantic, Lily the leatherback is swimming, unaware of her own daunting odds. She simply navigates the waters she’s in. Like we all have to. But there is strength in that journey. There is hope. And it is strength and hope I wish for Miss Lily Rose.